The last time California endured a drought, legislators set their sights on the state’s heaviest water users: farmers. The state designed laws to push agricultural water districts to closely track their water flow and make the largest districts charge farmers based on how much they use. The economic theory is simple: If you aren’t paying for how much water you actually use, you have little incentive to try to consume less. But those rules are widely being ignored as they come into effect in the midst of one of the state’s most severe droughts on record. All but the smallest agricultural water districts were required to track and report to the state how much water they deliver to customers as the result of a 2007 law. Only 20 percent – 48 of 242 districts – have filed those reports, according to California Department of Water Resources data. They were due 10 months ago. Under a 2009 law, the 55 largest agricultural water districts also are required to more precisely measure how much water each farmer is using. They’re then required to charge farmers – at least in part – on that basis. The state doesn’t know how many suppliers are meeting this requirement or are even taking steps toward doing so, because almost half of them have failed to turn in the relevant reports, records show. 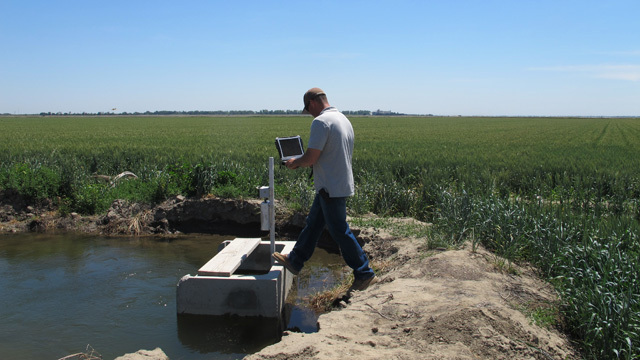 Charging for water based on use had been common in some agricultural areas where water is scarce, like the San Joaquin Valley. But now, it’s mandatory for large districts throughout California. These water management plans, which spell out how the districts will make the changes, were due at the end of 2012. Districts face few consequences for failing to comply. By contrast, most residential water customers in California, whose use is metered, have long seen how much water they use reflected in the bills they receive. “Throughout the state, people should be paying for water based on how much they use, and that will drive conservation,” said Peter Brostrom, program manager of water use efficiency for the Department of Water Resources. Agriculture, which accounts for some 80 percent of the water that’s used in the state, has met the new rules with skepticism and indifference, as growers cope with the drought. The Tulelake Irrigation District in Siskiyou and Modoc counties is not following the new rules. Earl Danosky, the district’s manager, said he has no plans to charge farmers for how much water they use individually. The district currently charges a flat per-acre fee once a year. Danosky said he didn’t realize he was supposed to be turning the reports in to the state. The district serves hundreds of family farms, which grow potatoes, onions, alfalfa and mint near the state’s northern border with Oregon. Down in the Sacramento Valley, Reclamation District 108 is on track to meet the state’s new requirements. Still, farmers there doubt the changes will inspire much water conservation in their area. 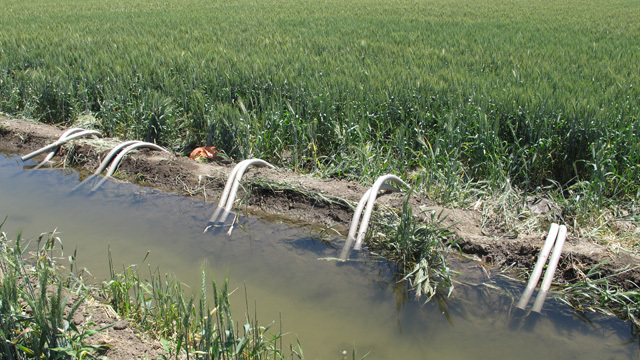 Water flows from the district’s system of canals through farm gates and into ditches next to the farmers’ fields, where it is used for irrigation. Rice especially relies on a lot of water. Growers flood the fields, allowing plants to sit in four inches of water. Water that drains off the fields is reused on other fields, accounting for about 40 percent of the total water the district delivers. Local farmers voted to install a $2 million system to measure how much water comes out of these canals. Now, changing the district’s pricing to meet the regulations will require another vote. District officials hope to have the new pricing in place by the start of irrigation in spring 2016. If Durst’s water bill goes way up, he said he likely won’t use less water. He said he’ll probably just grow a specialty rice that will fetch more on the market. Districts’ failure to comply with the requirements troubles environmentalists who promote conservation as one tool for taking on the state’s water woes. “Unless these districts start taking this seriously, it’s going to be their customers that suffer,” said Claire O’Connor, agricultural water policy analyst for the Natural Resources Defense Council. The Department of Water Resources has had to rely on letters and workshops to try to cajole districts into complying. There’s no penalty for agricultural districts that don’t report how much water they’re delivering to farms. Large districts that haven’t submitted their water management plans to the state have lost access to $472 million in state grants to encourage conservation and improve water management. But once they turn in their plans, they are eligible for funds again. That money could be used to help farmers in their districts install more efficient irrigation systems, for instance. A third party could sue districts for not fulfilling the requirements, but there’s little talk of this being in the works. Farmers aren’t the only ones whose water use came under the legislative microscope during the last drought. The state is now trying to achieve a 20 percent reduction in urban per-capita water use by the end of 2020, based on the same law that targeted large agricultural districts. This story was edited by Andrew Donohue. It was copy edited by Nikki Frick and Christine Lee. This story was produced by The Center for Investigative Reporting, an award-winning nonprofit news organization based in the San Francisco Bay Area. For more, visit cironline.org. Mieszkowski can be reached at kmieszkowski@cironline.org. Listen to the companion radio story on The California Report.